As I write this note, I have Twitter open, and Facebook beside it, keeping an eye on High Country News’ channels. I have our internal messaging service open and my work email, too. This is a normal day for me and for many others: Our work requires us to be plugged in and paying attention. That means it requires an internet connection fast enough to load all those sites for me and all my colleagues. In Paonia, Colorado, the town of 1,400 where High Country News is based, that’s been the work of decades. And many days, it’s still a work in progress. For the past year, a group of New Mexico news organizations, with support from High Country News and the Solutions Journalism Network, has investigated how to build rural communities that last. (To read our past stories, check out the archive here.) Among other things, we’ve found a lack of high-speed internet holds communities back. 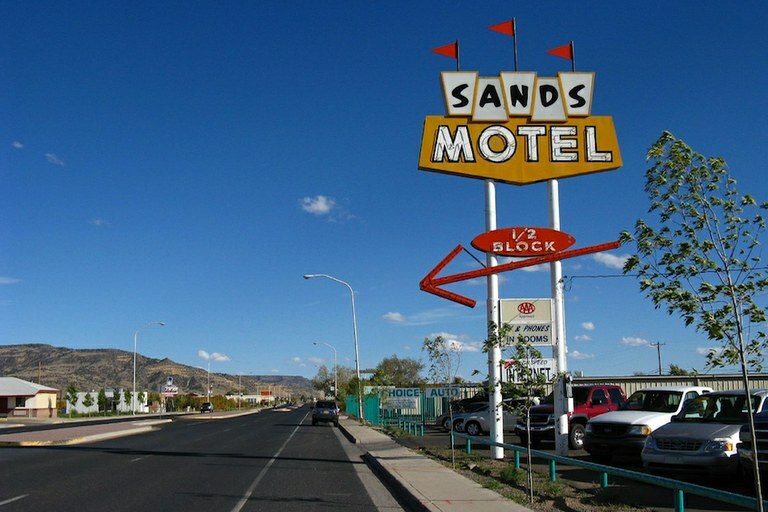 A motel in Grants, New Mexico. Nationwide, 39 percent of rural Americans — 23 million people in total — don’t have access to the internet, according to the Federal Communications Commission. And people in rural areas are far less likely to use the internet than those who live in cities or suburbs, Pew surveys have found. Those gaps are especially high on tribal lands and in low-income communities — a phenomenon known as the digital divide. As more businesses rely on the internet, the gaps between the broadband haves and have-nots grow. In New Mexico, only 80 percent of residents have access to a high-speed internet connection, according to Broadband Now. That’s in spite of promises by the state that everyone in New Mexico would have access to broadband by 2015 and an influx of funds for broadband expansions. So we decided to dig into what local communities, tribal nations and individuals are doing to bridge the digital divide. Infrastructure is still where most of the money and effort is going; communities like Taos and the Pueblo de Cochiti are making the most of federal funds and local support to get hooked up to high speed internet. And this is often where communities stall, trying to figure out how to get fast internet access — and whether they even want it. 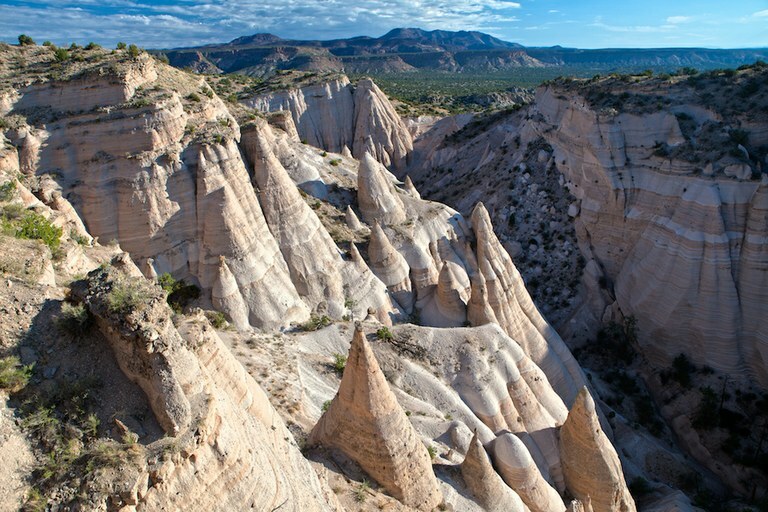 Kasha-Katuwe Tent Rocks National Monument, near Pueblo de Cochiti, New Mexico. But for many, the question of how to turn digital connectivity — once you have it — into economic growth can prove equally intractable. Plenty of towns enjoy lightning-fast connections; far fewer have leveraged that resource to drive jobs and development. That’s where a new program in Grants comes in. It looks to train adults how to succeed as remote workers, a growing swath of the American labor force. It’d be foolish to assume that Denver- or Seattle-grade internet speeds will automatically propel rural communities into economic prosperity. No doubt the leadership, vision and resources that built rural America in the first place are still necessary, too. If it works, though, small towns increasingly will be populated by people like me, tabs open on their computer screens, a long way from our mining, ranching and farming pasts. Want to read more on rural sustainability? Check out The Montana Gap project, produced in collaboration with our Montana media partners.